I don’t care what season it is, if I find a decent pina colada scent, I usually purchase it. I love love LOVE sweet coconut and pineapple scents – any time of the year. They just go together like peanut butter and jelly only tropical, fresh and sugary sweet. Beachside Pina Colada from Food Network smelled like a creamy and sweet pineapple with very little coconut. The wax didn’t smell very strong initially but hoping the aroma will come to life once melting. I used the entire clamshell pack (3 cubes each) in 2 electric melters in my great room. Once melting, it took a good 10 minutes to really start noticing the aroma and from then on out, I loved it. Sweet and sugary pineapple with hints of coconut wafted all throughout my great room. I would have preferred equal parts pineapple and coconut but it’s all good… I still enjoyed it, enough to purchase it again. Strength – these melts gave a decent throw. On a scale of 1 to 10, I would rate these an 8 in a large room. 10 and above in a small to medium size rooms. Not bad all in all. 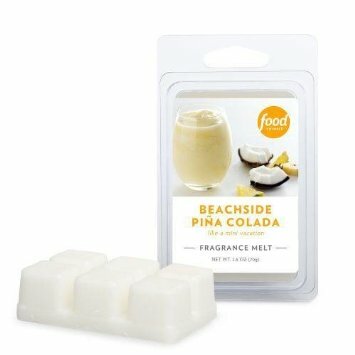 In closing, I do recommend Beachside Pina Colada if you love tropical scents. It was nice. Just try and catch a sale at Kohl’s, otherwise this brand is a bit pricey.